Indian Prime Minister Narendra Modi will be heading off to Japan on October 28 for the latest annual summit meet with his Japanese counterpart, Shinzo Abe. 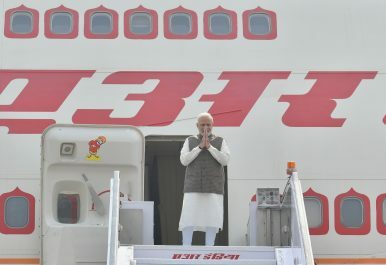 This will be Modi’s third visit to Japan and the 13th annual summit between the two nations. Modi and Abe have developed a personal chemistry over the last five years and there is a close bond between the two. During the 2017 summit, Modi had hosted Abe in Ahmedabad with great fanfare, replete with a road-show, visits to historical sites and a traditional Gujarati dinner. Taking this tradition forward, Abe is also planning to give Modi a warm welcome, including a private dinner at his at his holiday home in Yamanashi prefecture. The highlight of the visit is likely to be the commencement of talks on a military logistics pact, the Acquisition and Cross Servicing Agreement, between the two nations that will give them access to each other’s bases. Underscoring close strategic cooperation between the two major naval powers in the Indo-Pacific, this pact would allow Japanese navy get access to fuel and servicing at major Indian naval bases including the Andaman and Nicobar islands, even as Indian ships would be able to use Japanese facilities for maintenance. India has signed such pacts with other like-minded powers like the United States and France and it is important to expand the Indian footprint in the wider Indo-Pacific. Indo-Japanese military cooperation has been expanding rapidly with the two nations holding bilateral maritime exercises and the first-ever joint army exercises next month. The Malabar exercises involving the United States Navy continue to evolve into more ambitious undertaking with each passing year. Defense ties between India and Japan have grown considerably though New Delhi still has concerns about Japanese bureaucracy dragging its feet in sharing defense equipment and technology despite political push from Abe. Connectivity is another area which is getting a lot of focus in India-Japan relations. As China’s Belt and Road Initiative reshapes Eurasia and the Indo-Pacific, other regional powers like India and Japan are also entering the fray. The Asia-Africa Growth Corridor being spearheaded by India and Japan is one such example. But the two nations are looking beyond this and remain committed to pursue joint connectivity and infrastructure projects in the Indo-Pacific area including in India’s north-eastern and eastern neighborhood. Japan is investing significantly in upgrading infrastructure in the Northeast which will also link India more substantively to Southeast Asia. Modi and Abe are likely to unveil “a concrete infrastructure project implemented together” in South Asia. One of the more interesting aspects of this summit’s engagement will be New Delhi’s attempt synergize Modi’s Ayushman Bharat scheme and the Japanese healthcare program, Asia Health and Wellbeing Initiative. Modi has been very ambitious with this healthcare scheme and will be keen to get Japan’s support to seeing the project through to its logical conclusion. The tectonic plates of global geopolitics are shifting rapidly and both India and Japan are trying to cope. Abe was in China this week for a landmark visit, the first by a Japanese prime minister in seven years. The two nations signed a number of agreements, including reviving a currency-swap deal dropped in 2013 and more than 500 business pacts even as they called for an early conclusion to a trade pact involving 16 Asian countries. The foreign policy of the Trump administration is playing a big role in this recalibration by the two Asian nations as Japan is concerned about the potential U.S. withdrawal from the region and China is grappling with the consequences of an escalating trade war with the United States. India too has tried to reach out to China in recent months with Modi’s informal summit with Chinese President Xi Jinping in Wuhan. It is rare to have a strategic convergence of this order between any two nations and Modi and Abe have built on this convergence by using their personal equation. As the Indo-Pacific strategic landscape undergoes a churn, it is incumbent on the two nations to keep working together as the two primary democratic actors in the region. Apart from shaping the regional balance of power, they will have to do their bit for shaping the normative and institutional architecture of the region. That’s a responsibility that will increasingly come to these two powers and they should not be found wanting.